Advanced Defender is a new rogue antispyware program. It is a clone of Personal Protector. 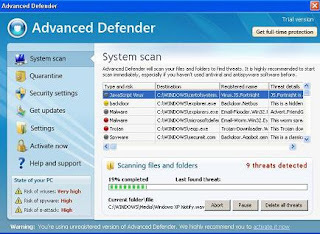 Advanced Defender is promoted and installed through the use of trojans. When started, it will perform a scan and reports a lot of fake infections. If your PC is infected with the rogue, then use the Advanced Defender removal guide.